France Prešeren[lower-roman 2] (pronounced ) (2 or 3 December 1800[lower-roman 3] – 8 February 1849) was a 19th-century Romantic Slovene poet, best known as the poet who has inspired virtually all later Slovene literature and has been generally acknowledged as the greatest Slovene classical author. He wrote some high quality epic poetry, for example the first Slovene ballad and the Slovene national epic. After death, he became the leading name of the Slovene literary canon. 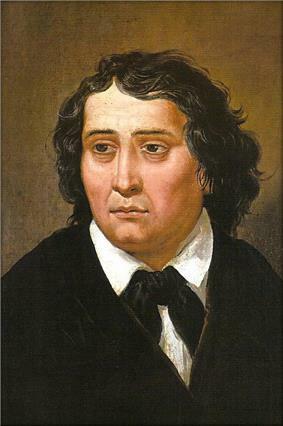 During his lifetime, Prešeren lived in conflict with both the civil and religious establishment, as well as with the provincial bourgeoisie of Ljubljana. He fell victim to severe drinking problems and tried to take his life on at least two occasions, facing rejections and seeing most of his closest friends die tragically. His lyrical poetry dealt with the love towards his homeland, the suffering humanity, as well as his unfulfilled love towards his muse, Julija Primic. Although he wrote in Slovene, some poems were written in German, too. As he lived in Carniola, he at first regarded himself a Carniolan, but gradually took the broader Slovene identity. His poems has been translated into English, French, German, Italian, Spanish, Hungarian, Slovak, Polish, Russian, Ukrainian, Belorussian, Bengali, as well as to all the languages of former Yugoslavia, and in 2013 a complete collection of his "Poezije" (Poems) was translated to French. The Wreath of Sonnets (Sonetni venec) is Prešeren's most important poem from his early period. It is a crown of 15 sonnets. It was published on 22 February 1834 in the Illyrian Paper. In it, Prešeren tied together the motifs of his own unhappy love with that of an unhappy, subjugated homeland. The poem was recognized as a masterpiece by Matija Čop, but it did not gain much recognition beyond the small circle around the journal Krajnska čbelica. Moreover, Julija was unimpressed. Understandably, Prešeren moved to more bitter verses. 1835 was Prešeren's annus horibilis. 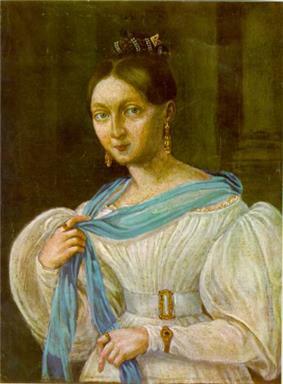 His closest friend Matija Čop drowned while swimming in the Sava River, Julija Primic married a wealthy merchant, and Prešeren became alienated from his friend and editor of the literary journal Krajnska čbelica, Miha Kastelic. 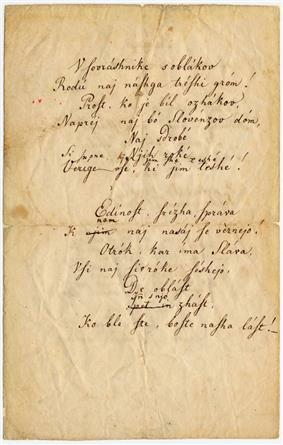 Following his best friend's death, Prešeren wrote Baptism on the Savica (Krst pri Savici), dedicating it to Čop. Set during the forced Christianisation of the predecessors of Slovenes, the Karantanians, in the late 8th century, the poem addresses the issues of collective identity and faithfulness to the ancestor's ways, as well as the issue of individual and his hope and resignation. The philosopher Slavoj Žižek interpreted the poem as an example of the emergence of modern subjectivity. ^ Translator and a Slovene writer who writes in English, Erica Johnson Debeljak, has been quoted comparing the status of Prešeren in Slovene culture to an entity as ubiquitous as air, describing in her essay "Prešeren's air" how he is frequently referenced to as simply "the poet", the identity of whom is obvious to all but to the yet uninitiated into the Slovene culture. ^ The portrait was the first depiction of the poet and the only one created from the memory of his actual appearance. After 1900, this depiction served as the pattern for later depictions although its veracity has been doubted. 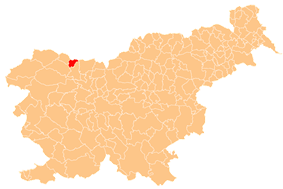 ^ In his home village he was also known as Ribčev France. ^ Although his birth date has been mostly presumed to be 3 December, in 2002 a detailed family tree of the poet's family, published by the Slovene Genealogical Society, put the date of his birth on 2 December, whereas 3 December has been identified by them as the date of his baptism. ^ a b Šavc, Urška. "Zbirka portretov Franceta Prešerna" [The Collection of Depictions of France Prešeren]. In Šmid Hribar, Mateja; Golež, Gregor; Podjed, Dan; Kladnik, Drago; Erhartič, Bojan; Pavlin, Primož; Ines, Jerele. Enciklopedija naravne in kulturne dediščine na Slovenskem – DEDI [Encyclopedia of Natural and Cultural Heritage in Slovenia] (in Slovenian). Retrieved 31 January 2013. ^ Globočnik, Damir. "Prešeren in likovna umetnost" [Prešeren and the Visual Arts] (in Slovenian). Retrieved 31 January 2013. 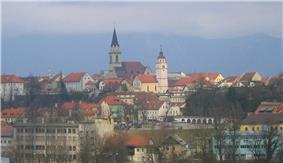 ^ Kunčič, Mirko (30 December 2002 Genealogy Society). 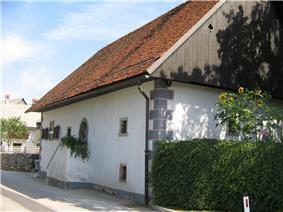 Slovenske novice [Slovene News]. ^ Juvan, Marko (5 May 2011). "Čop in Prešeren ali transfer svetovne književnosti na Kranjsko" [Čop and Prešeren or the Transfer of the World Literature to Carniola] (PDF) (in Slovenian). Ljubljana. ^ Svetina, Peter (8 February 2008). "France Prešeren, največji slovenski pesnik" [France Prešeren, the Greatest Slovene Poet] (PDF). Novice – Slovenski tednik za Koroško. ^ a b Merhar, Ivan (1901). "France Prešeren". Slovenka 5 (1) (Konzorcij Edinosti). p. 9. ^ Rozka, Štefan (1974). "Angleški slavist o Prešernovih nemških pesmih" [The English Slavist about Prešeren's German Poems] (in Slovenian) 19 (8). Slavistično društvo Slovenije [Slavic Society of Slovenia]. pp. 324–325. ^ Perušek, Rajko (1901). "Prešeren in Slovanstvo: Z dostavkom uredništva = A. Aškerc". Ljubljanski zvon 21 (1) (Tiskovna zadruga). p. 64. ^ "France Prešeren: Življenjepis: 1800–21: Otroška leta v Vrbi in pri stricih v Ljubljani, šolska leta v Ljubljani" [France Prešeren: Biography: 1800–21: Children Years in Vrb and by Uncles in Ljubljana, School Years in Ljubljana]. Preseren.net (in Slovenian). Založba Pasadena d.o.o. Retrieved 31 January 2013. ^ Kolar, Ivan (1958). "Literarni sprehod po Ljubljani" [A Literary Walk Through Ljubljana]. Jezik in slovstvo [Language and Literature] (in Slovenian) 4 (1): 77. ^ Vrhovnik, Ivan (1912). "Vodnik in Prešern – člana Kazine" [Vodnik and Prešern – Members of the Kazina]. Ljubljanski zvon (in Slovenian) 32 (3): 167–168. ^ Habič, Marko (1997). "Kazina" [The Casino Building – Kazina]. ]A Pictorial Chronicle of a Capital City [Prestolnica Ljubljana nekoč in danes. Geopedia.si (National Publishing House of Slovenia). ^ a b Slodnjak, Anton (2009). "France Prešeren". In Vide Ogrin, Petra. Slovenski biografski leksikon [Slovene Biographical Lexicon (in Slovenian) (Elektronska izdaja [Electronic Edition] ed.). Scientific and Research Centre, Slovene Academy of Sciences and Arts. ^ "France Prešeren: Življenjepis: 1833" (in Slovenian). Retrieved 5 November 2010.